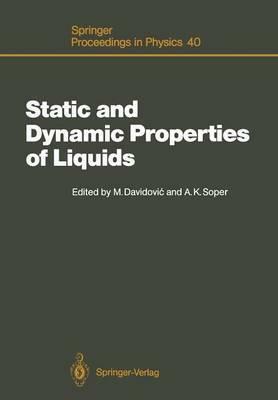 The idea of a workshop devoted to the static and dynamic properties of liquids arose from two smaller meetings on the same topic held at the Interfaculty Reactor Institute, Delft, The Netherlands in 1985 and 1987, and from the LAM conference (International Conference on Liquid and Amorphous Metals) held at Garmisch- Partenkirchen, FRG, in 1986. The object of the Workshop was to bring together experimentalists, theoreticians and people working on computer simulations in or- der to learn about developments in the microscopic behaviour of liquids. Approx- imately 35 scientists from Austria, France, Israel, Italy, Sweden, The Netherlands, the United Kingdom, the Federal Republic of Germany and Yugoslavia gathered at the Hotel "Libertas", Dubrovnik, in Yugoslavia, June 27-30, 1988 to hear ten in- vited talks and nineteen contributed papers on a wide range of subjects, including generalized hydrodynamics, mode coupling theory, liquids at surfaces, extraction of effective potentials, and the glass transition. The most numerous were the papers dealing with computer simulation, and then those on supercooled liquids and the glass transition. The number of experimental results was relatively small, which points to difficulties in this kind of research (evaluation of experimental data). The workshop closed with an expanded round-table discussion of the main themes of the meeting, with an emphasis on the likely trend of investigations in the future. This discussion is summarized at the end of this volume. Illustrations note IX, 225 p.
I Generalized Hydrodynamics and Mode Coupling Theories.- Analysis of Neutron Scattering and Computer Simulation Studies on Noble-Gas Fluids.- A Liquid Metal as an Extensive Test Case of Static and Dynamic Properties.- The Transition from the Hydrodynamic Regime to the Kinetic Regime in Helium/Xenon Gas Mixtures as Measured by Light Scattering.- Transition to Hydrodynamic Behaviour and Mode Coupling Effects in Dense Hydrogen Gas.- Generalized Viscosity and Generalized Diffusion: MD and Neutron Scattering Data for Some Liquids.- Hydrodynamic Mode Coupling in a Simple Liquid.- II Theory of Liquids.- The Statistical Mechanics of the Ionic Equilibrium of Water. IV. The Force Law.- III Liquids at Surfaces.- Liquid Surfaces and the Effect of Premelting.- Monte Carlo Simulation of a Lennard-Jones Fluid near a Hard and a Soft Wall.- RISM Study of the Structure of Water at the Hydrophobic Wall.- Molecular Dynamics of Wetting and Drying at Solid-Fluid Interfaces.- Brillouin Scattering near a Solid-Liquid Interface.- IV Supercooled Liquids and the Glass Transition.- Liquid-Glass Transitions.- Scaling Behaviour of the Density Fluctuations near the Glass Transition: A Signature of Critical Instability.- Structural Relaxation and Glass Transition of Binary Liquids.- Structural Relaxation in Glass-Forming Liquids.- Aspects of Atomic Dynamics in Liquid Rubidium Above and Below the Melting Temperature.- Dynamical Correlation Studies of Metal-like Systems in the Supercooled Phase by Computer Simulation.- Electrical Properties of Liquid Quenched Alloys.- A Molecular Dynamics Study of the Liquid-Glass Transition in Lennard-Jonesium.- V Structure of Liquids, Effective Pair Potentials and Three-Body Forces.- The Electronic Structure of Liquid Metals.- Charge Correlations in Molecular Fluids and Impurity Absorption Spectra.- Pair Potential in Liquid Bismuth from Structure Data.- Extracting the Pair Correlation Function from Structure Factor Data by Monte Carlo Simulation.- Neutron Diffraction Study of Liquid Chlorine and Liquid Phosphorus Tribromide at 295 K.- Static Correlations in Rare Gases from Integral Equations for Realistic Model Interactions.- Three-Body Forces and Virial Expansions of S(k) and g(r) in Gaseous Kr205.- Interaction-Induced Light Scattering in Dense Gaseous Krypton: Many-Body Effects.- VI Summary.- Summary of the Workshop on Static and Dynamic Properties of Liquids.- Index of Contributors.